KE00033 is a solid phase sandwich Enzyme Linked-Immuno-Sorbent Assay (Sandwich ELISA). 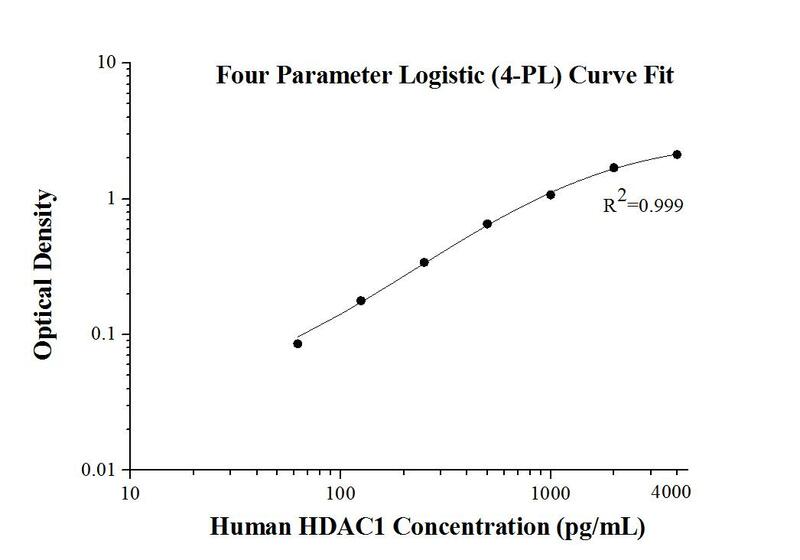 The HDAC1 ELISA kit is to be used to detect and quantify protein levels of endogenous HDAC1. The assay recognizes human HDAC1. A polyclonal antibody specific for HDAC1 has been pre-coated onto the microwells. The HDAC1 protein in samples is captured by the coated antibody after incubation. Following extensive washing, a monoclonal antibody specific for HDAC1 is added to detect the captured HDAC1 protein. For signal development, horseradish peroxidase (HRP)-conjugated antibody is added, followed by Tetramethyl-benzidine (TMB) reagent. Solution containing sulfuric acid is used to stop color development and the color intensity which is proportional to the quantity of bound protein is measurable at 450nm with the correction wavelength set at 630 nm. Histone deacetylases (HDAC) are a class of enzymes that remove the acetyl groups from the lysine residues leading to the formation of a condensed and transcriptionally silenced chromatin. The protein encoded by this gene belongs to the histone deacetylase/ acuc/ apha family and is a component of the histone deacetylase complex, which is responsible for gene expression silencing. It also plays an important role in the control of cell proliferation and differentiation by interacting with RB, p53 and other transcription factors. HADC inhibition causes apoptosis in tumor cells and HDAC inhibitors may be developed as anti-cancer agents. This kit is used to quantify HDAC1 level in vivo.